"The ultimate purpose of business is not, or should not be, simply to make money. Nor is it merely a system of making and selling things. The promise of business is to increase the general well-being of humankind through service, a creative invention and ethical philosophy". Environmental awareness and accountability has become the priority of humanity consciousness due to which environmentally responsible practices have become more evident. Many organizations have altered their practices by voluntarily taking environmental responsibility. The concept to conserve natural resources can be traced back to the 1800s. However, it was not until 1970 that the first Earth Day was established. Increasing consumption of diminishing natural resources, air and water pollution, ever-growing landfills, and the effects of global warming, makes saving our environment imperative. So going green is the right thing to do. The concept of going green involves a person, family, or group becoming more conscious about the destruction of the environment and adopts practices that help reduce waste or become more energy efficient. The color green is used because it reminds us of the outdoors and the environment. Similarly, field of dentistry has adopted this concept so as to make it environmental-friendly. Dentists have adopted practices to reduce/minimize the environmental impacts in office administration, marketing, construction, design, and dental processes and materials. This is called as green dentistry or eco-dentistry. Eco-dentistry association defines green dentistry as "a high-tech approach that reduces the environmental impact of dental practices and encompasses a service model for dentistry that supports and maintains wellness". It is based on waste reduction, energy conservation, and pollution prevention. The purpose of this review is to raise widespread awareness of environmental alternatives in the dental community and to provide a series of "green" recommendations that dentists around the world can implement to become leading stewards of the environment. (4) Placement and removal of mercury-containing dental material- Amalgam-filling material includes equal parts of elemental mercury and an alloy powder mostly composed of silver, tin, and copper. Mercury in drinking, irrigation, and fishing waters is a serious environmental and human-health concern. A potent neurotoxin, mercury poisoning is devastating to animal species and is a tragic and debilitating experience for people and families suffering its effects. Major source of mercury entering local wastewater treatment facilities originates in dental offices. New products and technologies for cleaner, greener dental practices are emerging, allowing practitioners to mediate, or completely eliminate, much of this waste. But still there are a lot of things to be done. Implementing small, affordable changes can make a significant impact on long term environmental sustainability. Thinking about practices and protocols and discussing them with dental team may reveal ways to reduce, reuse, and recycle. The temperature of the supply and personal refrigerators can be monitored to ensure they are running efficiently. The Council on Dental Practice of the American Dental Association has framed list of their top ten ways to go green in the dental office. Use nontoxic cleaners and do not use too much disinfectant. The going green movement, which is rapidly becoming a worldwide priority, seeks to address environmental contamination, waste, and other critical environmental issues. Dentistry can lessen the combined environmental impact by utilizing the Four R's of going green (recycle, reduce, reuse, and rethink) can be easily applied to the dental office. It has been said that it is not possible to have healthy people on a sick planet. It is recommended that the dentist should take the initiative to practice better environmental management now. By conserving water, using digital imaging, and recycling the many recyclables that pass through the office of a green dentist, a great impact is made. However, that impact can be made greater as more dentists join the green dentistry movement and help make the world a cleaner and healthier place. 1. Hawken P. The ecology of commerce: A declaration of sustainability. Revised edition. New York: Harper Collins Publisher; 1993. 2. Newman E. Goinggreen making your dental practice environmentally friendly. AGD Impact. 2010;38:18-22. Available from: http://www.orasurgery.com/media/downloads/AGD-GoingGreen.pdf [Last assessed on 2013 Nov 10]. 3. American dental association council on dental practice. go green: It′s the right thing to do. Available from: http://dentalcare.com/media/en-US/education/ce383/ce383.pdf [Last accessed on 2013 Nov 11]. 4. Shetty V. Green dentistry. JIAPHD 2011;18:891-3. 5. Eco dentistry association. About green dentistry. Available from: http://www.ecodentistry.org/?aboutgreendentistry [Last accessed on 2013 Nov 11]. 6. Eco dentistry association. Dental office waste and pollution. Available from: http://www.ecodentistry.org/?page=OfficeWaste and hhSearchTerms=Dental+and+Office+and+Waste+and+Pollution [Last accessed on 2013 Nov 11]. 7. 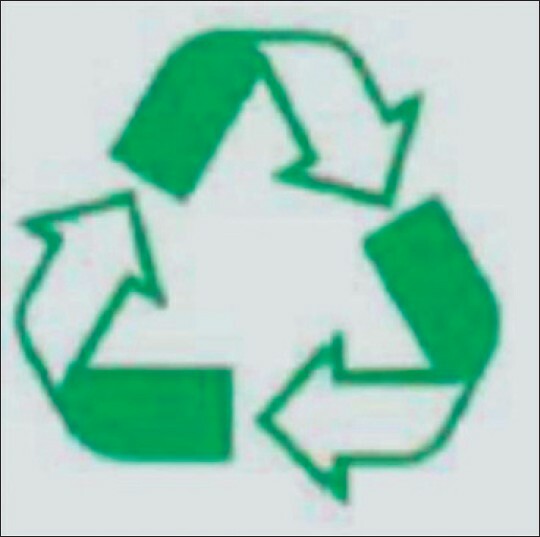 Earth9ll, com, Recycling, Available from: http://earth911.com/recycling/[Last accessed on 2013 Nov 11]. 8. Adams E. Eco-friendly dentistry: Not a matter of choice. J Can Dent Assoc 2007;73:581-4. 9. Hanoon R. What′s with the green? Changes that help dentistry preserve the environment. RDH 2011;31:74-86. Available from: http://www.rdhmag.com/articles/print/volume-31/issue-3/features/whats-with-the-green.html [Last accessed on 2013 Nov 11]. 10. Pockrass F, Pockrass I. The four "Rs"of ecofriendly dentistry. Am Dent Hyg Assoc 2008;22:18-21. 11. Hiltz M. The environmental impact of dentistry. J Can Dent Assoc 2007;73:59-62. 12. Hu-friedy. Environdent. Available from: http://www.hu-friedy.com/programs/environdent.aspx [Last accessed on 2013 Nov 11]. 13. CDC. Guideline for Hand Hygiene in Healthcare Settings. Recommendations of the Healthcare Infection Control Practices Advisory Committee and the HICPAC/SHEA/APIC/IDSA Hand Hygiene Task Force. Society for Healthcare Epidemiology of America/Association for Professionals in Infection Control/Infectious Diseases Society of America. MMWR Recomm Rep 2002;51:1-45. 14. Eco dentistry association. The global water crisis. Available from: http://www.ecodentistry.org/?saveswater [Last accessed on 2013 Nov 11]. 15. Donaldson K. Is your office environmentally responsible? RDH 2011;31:46-52. Available from: http://www.rdhmag.com/articles/print/volume-31/issue-4/features/is-your-office-environmentally-responsible.html [Last accessed on 2013 Nov 11]. 16. Dutt P. Green tea with gul. The Times of India (Times Life). 2012 April 22: Sect. ETC: 2. 17. Satterfield Z. Green building. Tech Brief 2009;8:1-4. 18. ADA. 150 ways to go green. Available from: http://www.ada.org/sections/professionalResources/pdfs/5402_150_ways.pdf [Last accessed on 2013 Nov 11]. 19. Henry K. Go green dentistry. RDH 2009;29:52-6. Available from: http://www.rdhmag.com/articles/print/volume-29/issue-3/feature/go-green-dentistry.html [Last accessed on 2013 Nov 11]. 20. Webster dictionary. Pollution. Available from: http://www.webster-dictionary.org/ [Last accessed on 2013 Nov 11]. 21. Eco dentistry association green dentistry is high tech dentistry. Available from: http://www.ecodentistry.org/?page=HighTechDentistry and hhSearchTerms=hi+and+tech+and+dentistry [Last accessed on 2013 Nov 11]. 22. CDC. Guideline for disinfection and sterilization in healthcare facilities, 2008. Available from: http://www.cdc.gov/hicpac/pdf/guidelines/Disinfection_Nov_2008.pdf [Last accessed on 2013 Nov 11]. 23. Berkhout E, Sanderink G, Stelt. Digital intra-oral radiography in dentistry. Diagnostic efficacy and dose considerations. Oral Radiol 2003;19:1-13. 24. ADA. Best management practices for amalgam waste, oct. 2007. Available from: http://www.ada.org/sections/publicResources/pdfs/topics_amalgamwaste.pdf [Last accessed on 2013 Nov 11].